Paphiopedilum vanguard (a cross between P. rothschildianum and P. glaucophyllum) was first registered by Pitt with the Royal Horticultural Society in 1921. This one was produced by Terry Glancy, who owns Pine Ridge Orchids in Homestead, Florida. We met him on a field trip with the Dade Chapter of the Florida Native Plant Society to his home. Besides his home and nursery, the property includes 15 acres of Pine Rockland, for which he and his wife, Barbara, began the difficult restoration process shortly after purchasing in 1978. After the field trip we found this orchid in the nursery. 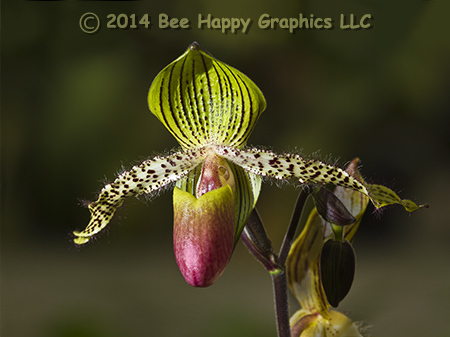 Lady slippers are in the Cypripedioideae subfamily of orchids, which includes five different genera. They are terrestrial, living in the shade of the forest. 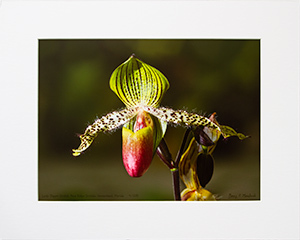 Orchids of the genus Paphiopedilum come from southeast Asia. 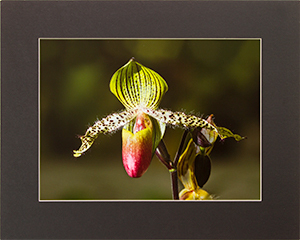 There are 12 species of lady slippers native to the U.S, all of the genus Cypripedium. Photographic details: Canon EOS 7D camera w/ EF 100-400mm f/4.5-5.6L IS USM lens set at 250mm. Off-camera flash was used. Camera was on f/11 for 1/180 sec at ISO 200. Fine Art Paper 12" x 16" 21" x 28"
Canvas N/A 28" x 37"